Resource persons from the Centre have visited several schools/ colleges and made power point presentations on the importance of RWH (List of schools, colleges and RWAs where talks were given). A publicity button was prepared and worn by all our volunteers in order to publicize RWH. A display signboard saying "RAINWATER HARVESTING DONE IN THIS PLOT" was made by our Trust and distributed to people who had implemented harvesting in their respective premises. The Centre put up stalls in several exhibitions, which has helped to popularize and promote RWH and Ecological Sanitation (Participation in Exhibitions). Distinguished people from several walks of life both from India and abroad have visited the Centre (List of distinguished visitors). The Centre's Director has been invited to participate in seminars, conferences and workshops organized both in India and abroad to present research papers on RWH, role of Rain Centres in popularizing RWH, groundwater recharge and Ecological Sanitation(Participation of Centre's Director in seminars/conferences/workshops). 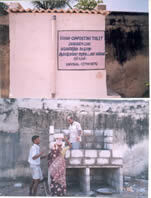 Several Institutions within Chennai city as well as in other cities in Tamil Nadu and other states were visited (on their invitation)to explore the possibility of harvesting the rainwater falling within their premises and present a feasibility report (List of Institutions visited and Feasibility Reports prepared). Our organization, has implemented RWH in several institutions, multi-storeyed apartment and commercial complexes etc. with the help of resource persons trained by the Centre (List of Institutions where RWH was implemented by the Centre). Since 2005 our organization has been involved in popularizing and promoting ecological sanitation in peri-urban and rural areas (More details are furnished in Ecological Sanitation). In order to promote RWH further and keep it alive, we propose to continue the activities in the three thrust areas of Education, Implementation and Evaluation/Research with the help of our Rain Centre. So far as RWH is concerned, Chennai is a success story. We would like to replicate the Chennai experience to more cities both within India and abroad. Cities, which are not rain starved but water starved, will be identified and sincere attempts will be made to promote and popularize RWH in them with the help of local individuals and NGOs. We propose to carry out water audits in schools and multi-storeyed apartment complexes to help them manage their fresh water sources judiciously. A questionnaire for this purpose has already been prepared. In schools this will be a good learning exercise for the students and for others it will help to sensitise them on the importance of water. We are also planning to sensitise urban residents about the need, relevance and importance of grey water recycling organically in situ. We are also keen to implement RWH and grey water recycling in charitable institutions such as old age homes, orphanages, homes for spastic children etc. with the funds received from corporate and other funding agencies. We at the Rain centre have recently come out with a new concept called "Conjunctive use of Aquifers". This is all about tapping the shallow and deep aquifers judiciously. We propose to create awareness among urban residents about the need, relevance and importance of this concept. We are in the process of publishing a book on Rainwater Harvesting, which will include an Instruction Manual (a user guide) for implementing RWH in any premises. We also plan to create awareness about the importance of ecological sanitation in a few more villages close to Chennai. Also construct a few more toilets in case we are able to mobilize funds from funding agencies in addition to monitoring the already constructed ones.